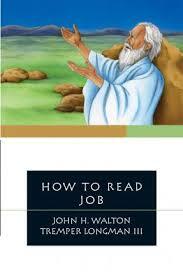 Here is a volume designed to help one get more out of reading the Book of Job. Scholars John Walton and Tremper Longman, both authors of larger commentaries on Job, team to make sense of what the Book of Job is means to us. The earlier part of the book covers issues that you might find in a commentary introduction. Part 1 discusses Job as literature in four chapters. There are interesting things like the structure breakdown (check out the chart on page 21) and a discussion of tensions in Job. I felt the chapter “Is Job A Real Person?” a dud and overlooking the information that would demand him to be a real person. Part Two gives six chapters on the characters in Job. Despite some interesting observations, the literary angle (characters as devices) was overdone. I could not follow the chapter on Satan at all. Part Three is where the book blossoms. Explaining the retributive principle, how it could be misunderstood, and the true theological message of Job, all give us much to think about. Trusting God is far more the point than getting answers in this life. The final part on reading Job as a Christian is not, in my judgment, as good as the preceding theological section. Still, I do not see how you could not be helped by reading this volume before you begin a study of Job. Whether you would agree or not with their conclusions, you would at least know well what the questions are. That is, of course, exactly what a book of this type should do. Although Lewis wrote this volume years ago, and Lewis needs no recommendation from me, this is a publishing milestone in this freshly annotated edition by David C. Downing. 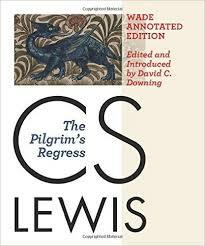 The Lewis volume, perhaps his toughest to penetrate, is opened up to us in such a greater way. As for the book itself, it is an allegory in the vein of John Bunyan, yet in the style of Lewis. His Pilgrim takes quite a journey! Puritania captures legalism quite profoundly. Lewis fans will love it while new readers will enjoy taking in on. The thing that stands out to me is how much I would have missed without Downing’s notes. I must confess that I would not have known most of what he shared had he not given this help. Downing has successfully taken a book that sounds well but would likely lose the reader and makes it more able to stand on the shelves as an equal to his other volumes. I imagine even Lewis himself would appreciate this edition. It comes in a lovely hardback and includes original illustrations. All in all, this is a keepsake that I highly recommend. This is the first volume in the latest round of revisions in the outstanding Tyndale Old Testament Commentary (TOTC) series. The editorship has fallen into the capable hands of David Firth. Debra Reid supplies this replacement of the well-respected Baldwin volume in a winning way. The Introduction, in 55 pages, covers the bases well for a volume of this size. If you are like me, you do not the excessive discussion on the literary style of the book as it often appears a charade to attack the historicity of Esther. Still, Reid covers what one must know to realize what scholars debate here. Canonization issues are sufficiently covered too. I gleaned more when Reid turned to a discussion of style. She taught me several things I had not noticed before. 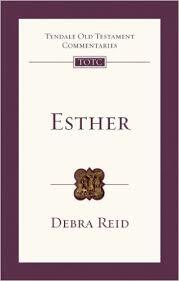 Thinks like there is little direct speech in Esther, or how key the narrator is as compared to, say, Ruth, and character discussions are all very fascinating. The commentary proper is even better still. The unique thing was the female perspective. There was no capitulation to feminism, but deep insights throughout. All in all, this is a fine, economical volume and I recommend it. Do you ever have that sinking feeling as Sunday draws ever closer that comes when you can’t decide what to preach on? I have had some tell me that this problem is the hardest they face in the pastorate. If they preach three times a week, that pressure can be strong. What can be done about it? Some grow to believe that there must be something wrong with them since ideas don’t come easily at a rate of three a week. Some just change pastorates often so they can just use the same sermons. While there is a place for the use of an old sermon, it ought not be simply because I can’t think of a new one. Some wonder if they just aren’t close enough to the Lord anymore! Could the problem be more the whole approach than a lack of creativity? Could the normal method be doomed from the start? The normal method is first I chose a subject or idea, then I select a text to highlight my subject or idea. From there I may chose to go the topical route. That presents quite a problem in a long pastorate. Just how many good topical sermons can one person come up with on a specific subject? I heard one famous preacher once claim he really only had 20 topics he preached on and he just rotated them. He had quite a following. His sermons varied from topical to loosely textual. I suspect that would not be effective for most of us. Even if we went the textual or expository route, which is far preferable, we have to find the text that really matches our subject. What will we do if we start deeply studying and finally figure out that our text in its context is not really talking about our subject? Sunday will be even closer! That seems living on the edge. So what do I suggest? You would never guess it from my misleading blog title. Give up choosing a sermon subject! Just choose a text! See where it takes you and just preach it. I keep a sermon seed plot that is nothing but a list of texts that jumped off the page at me. In reading or studying you will be all across the Bible, so there will be many opportunities. You may be reading books and the author mentions a text in passing, and there’s another one for the seed plot. I probably never have less than thirty of these in my seed plot, so it’s just a quick prayer of “Which one, Lord?”, and I am on my way. No agonizing over a subject for me. I may not even know my subject till I’ve studied for a few hours. You may ask, How does that allow for trying to address perceived needs in the congregation? Of course, a text may come because I am thinking about a perceived need, but not necessarily. This is hard for me to prove, but I have often been amazed at how the text addressed these needs. As for me, I believe I would be far less likely to address needs were I to try to pick that first. 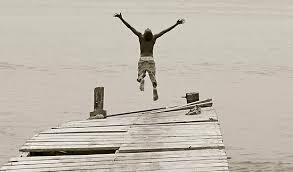 I’ll offer the flimsy evidence that I have on occasion thought a text would address issues only to find a careful study of the passage led me somewhere else and was far better than where I thought I was going. This doesn’t only refer to preaching through a Bible book or a series. In my ministry, I have settled into not doing a series on Sunday morning. We may be anywhere in the Bible at that service. By the way, this is how Spurgeon did most of his services. This method has other advantages. Remember our discussing how our topical preaching may fall into triteness? If you preach topically on prayer, for example, you will run out of things to say quickly. But the Bible is full of passages on prayer that approaches the subject freshly and creatively in every case. What you can do, then, is tap your preaching into the Bible’s natural creativity. You’ll never have to be dull or trite again! Plus you won’t waste all that time just trying to pick a subject any more. Happy preaching! This volume tackles the tough questions, as the subtitle “Affirming Creation And Providence In An Age Of Anxiety” suggests. It is scholarly (I would guess graduate level), yet highly readable even if this is not your specialty. Dr. Highfield gives evidence of deeply thinking on everything involving these issues. The book is in three parts: Creation, Providence, and the Problem of Evil. By the time you finish you will see that the problem of evil is where your beliefs on creation and providence are tested. I was genuinely impressed with the author’s presentation, logic, and fairness. Though he was a strong Bible believer and conservative in theology, he did not write to support one theological persuasion as much as addressing the hardest questions we Christians will ever hear or think. Highlights include his explanation of the glory of God (pg. 111), his interaction with evolutionary biology (pg. 159), his description of reading the OT christologically (pg. 206), his phenomenal discussion of foreknowledge (pg. 226 ff), and his majestic handling of the problem of evil. This volume will get the most prominent place on my shelves for this subject. I highly recommend it! The Foolishness Of Preaching Podcast–Encouraging Bible Preaching! 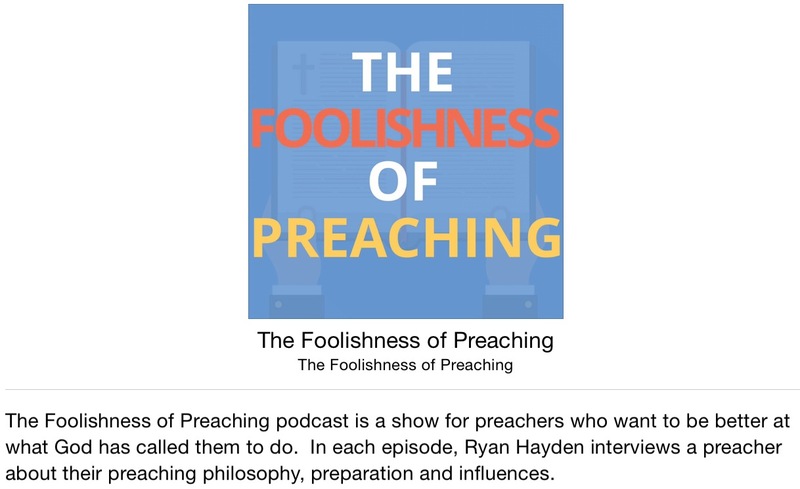 I hope you have heard of Ryan Hayden’s new podcast–The Foolishness of Preaching. Ryan did a lot of blogging in the past and chose to try a new avenue to champion the cause of expository preaching. He believes, as I do, that the dearth of preaching the Bible is the cause of many of the problems we have today. We have too much in pulpits of what man says–we need to hear what God says! Ryan takes preachers who love expository preaching and interviews them on philosophy of preaching and ministry, study methods, favorite books, and then personal elements of the preacher. Ryan is quite the interviewer and puts a lot of time in this weekly project. This is a positive, wonderful attempt to help the cause of preaching. Maybe it will be an OK episode. I have a face that only audio could love! In any event, I am honored that Ryan would put me on his fine podcast. 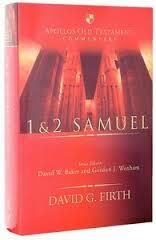 This commentary on two of the more exciting books of the Bible is a real asset to pastors and Bible students. Firth is becoming quite the prolific commentator of late and tackles here another historical book of the Bible (since he rightfully argues the two are one book). His Introduction is sufficient, and at 48 pages for a larger Bible book, it is quite succinct. While he writes well on genre and purpose, I couldn’t follow his thinking on authorship or sources–in fairness, it wasn’t radical. His explanation on narrative was insightful, but his discussion on central themes were spot on and the best the Introduction had to offer. The commentary was by the far the best value in the book. He followed the standard Apollos setup with translation, notes on the text (just the right coverage for pastors), form and structure (with enough detail to explain its short discussion in the Introduction), comment (thought-provoking), and explanation (where he well ties it together). I looked at several passages and enjoyed what he shared. He took extra care in the most famous passages (David and Goliath, for example). I had read criticism before I received this volume on his analysis of David with Bathsheba, and while I might fully agree with him there, he argued his point well. David did, as he said, not completely hide his sin from those he sent to get Bathsheba. He feels that David was more interested in getting Uriah out of the way to get the child than to hide his sin. I doubt that is true, but it does make you think! This is a fine volume. As a point of comparison, this volume is fair superior to the well known Word Biblical Commentary volumes covering the same material. I highly recommend it. Here is the latest volume in the Resonate series of unique commentaries published by IVP. 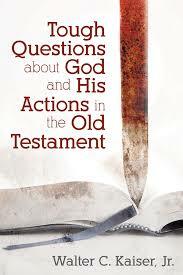 Song-Chang Rah brings different perspective to the Book of Lamentations than you would get in other volumes. 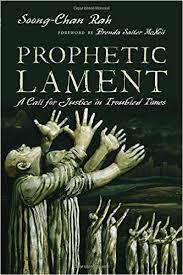 He highlights the Biblical genre of lament that is clearly a dynamic part of Lamentations. He attempts modern application as well as the subtitle “A Call for Justice in Troubled Times” suggests. The volume succeeds when he discusses lament in the Bible. He reminds us that lament is much more prevalent in the Bible than in our theological understanding today. His chapter on the historical context of Lamentations is well done. He explains how the funeral dirge is classic lament. When he exegetes the text, he does well. His writing skills are engaging and good enough to make commentary reading pleasant. The volumes stumbles in some of his modern application and even a few historical theological conclusions. His comparison of a theology of suffering versus a theology of celebration will really make you think. His modern example of slavery in the earlier days of our country as he made you feel their plight and heartfelt lament was superb. But when he credited (?) dispensational theology for giving us “an individualistic soul-saving soteriology”, which was actually akin to revival, and discusses it as a bad thing–that is hard to swallow. His focus on race problems in our country today as an application of his theme is marred by his unquestioned acceptance of the most liberal recounting of events. Had he been more balanced there, he would have been easier to follow. He seems so obsessed on race that I wondered as I read if he had been the victim of some particularly ugly racism in his own life. I found no value in his epilogue on Ferguson. If you look past racial politics and focus on his commentary, you will find value here. For me, it is not a first-line resource, but a fine secondary resource to gain additional, helpful insights.